Mae's Crafty Creations: Happy Friday!! I was able to complete this card yesterday for my entry for the guest designer contest being held over at Susana's PCP Group. This is my entry for the Lockhart group. Isn't that just the cutest stamp? No words are really needed...the image says it all. 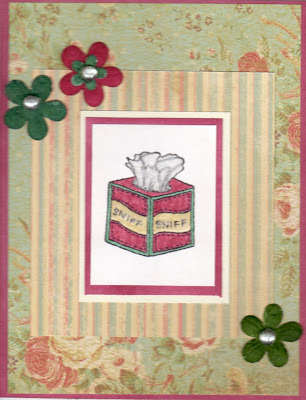 My inspiration for this card came from Suzanne. I used fun flock from CTMH for the tissue, K&Co paper, Bella baubles (sold at Susana's store), copics & CTMH markers. I didn't have the Hollyhock CS (CTMH) so I used my ink on white cardstock & it works great when you are framing a picture & just need the edges of color from the paper. Stop on over at Susana's blog...Follow Your Heart to see the wonderful creations by the design team & Suzanne's excellent tutorials. Good luck Mae, very cute! I love that tissue box! I am still in love with your coffee dude...he rocks!! Thanks for the DT comment, I'm glad the anticipation is over, whew! I saw your picture on a couple of comments on blogs I frequent and so I thought I would stop by and say hi!!! Good luck on this it is great!!! Off now to see some of your other creations!!! So elegant & pretty! Great job!